It was reported that Clinton demanded she pick her own staff without anyone's approval. Is this the end of Hillary? Will she no longer be the bright star, blazing her own path across the political skies? Hillary Clinton could have been if she had chosen to stay in the Senate. She could have been a strong voice, sometimes supporting Barack Obama’s administration and sometimes opposing it. And in March, Obama questioned Hillary’s claim that she had real foreign policy experience. Well, she will be now. Having passed her over for vice president, Obama has now made her his secretary of state, the top position in his Cabinet (fourth in line of succession to the presidency after the vice president, the speaker of the House and the president pro tem of the Senate). But even this took some struggle and considerable drama. Drama and Hillary seem to go hand in hand, though this is not always her fault. Her husband seems the source of much of it. The negotiations between the Obama campaign and Hillary were protracted. True, Obama was getting a superstar. True, he was getting a well-qualified secretary of state who will have no trouble being approved by the Senate. But it was reported that Clinton made several demands, including the ability to pick her own staff without anyone’s approval. Could this really be true? If so, it is a mistake. When it came to picking her most recent staff — the staff of her presidential campaign — she made disastrous choices, picking people with little or no presidential campaign experience and a near total lack of discipline. She chose a staff that never understood either the central motivation of voters in 2008 (a desire for change) or the mechanics of how to win the nomination. Let’s hope Obama exercises quiet, behind-the-scenes but firm control over who will be part of Clinton’s staff at the State Department. There was still the matter of Bill, however. As I have said before, while some people have baggage, Bill Clinton is a Samsonite factory. It has been reported that it took no fewer than six negotiators (four on the Clintons’ side and two on Obama’s side) to work out the conditions that Bill would have to meet regarding the donors to his library, his global initiative program, etc., before Hillary could be named. Six negotiators! That used to be enough to end (or start) a war. But it was all necessary to obtain Hillary Clinton. Why did Obama want her this badly? Her appointment does, of course, remove what could be a critical public voice in the Senate and ends the speculation (however unlikely) that she might run against him in 2012. But it is sometimes important not to overlook the obvious. For all his criticism of Hillary during a tough campaign, Obama respects her and, perhaps equally importantly, knows she is respected abroad. True, she voted for the Iraq war (and refused to apologize for it or call it a mistake, which helped doom her campaign), but Obama understands her actions were political and not ideological. In the future, Hillary Clinton will no longer have her own political agenda. Her agenda will be the agenda of the president. And Obama has made it clear on a number of occasions that he will determine not just the tone but also the actions of his administration. Then there is Joe Biden. He is a person with foreign policy credentials of his own. And he will outrank Hillary. When Biden spoke at Obama’s news conference on Monday, I thought his use of the word “we” stood out. “We’ve brought together one of the most talented national security teams ever assembled,” Biden said. We. Meaning, me and Barack. Clinton will not be reduced to obscurity. 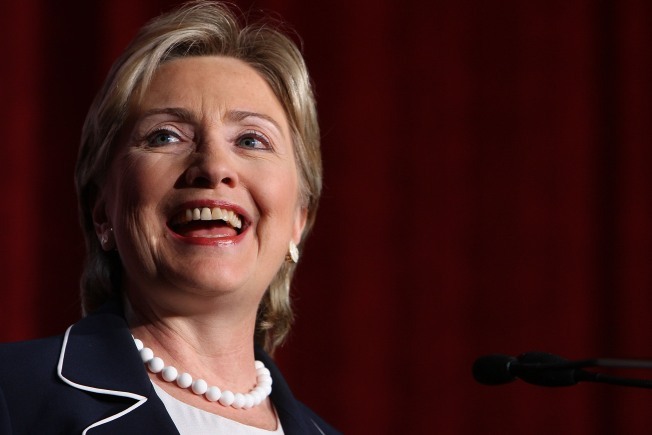 Could she have had a higher profile in the Senate than she will have as secretary of state? Possibly. But she doesn’t have the seniority for real power in the Senate. She may have gotten 18 million primary votes for president, but that really doesn’t count for all that much on Capitol Hill. As secretary of state, she can make a real contribution to solving global problems, creating peace where there is none now and restoring America’s standing in the world. So this is the end of the old Hillary. But the new Hillary could do a lot of good.